String algae is a very common filamentous type of algae that also goes by the names of hair algae, blanket algae, mat algae, and even pond scum (remind you of anyone?). The scientific name of string algae is claudophora spirogyra. String algae can be found in our koi ponds, water gardens, waterfalls, streams, water features, and fountains growing on surfaces such as rocks, liner, plants, and just about anywhere it can latch onto. The texture, color, and length of string algae can very and sometimes even appear black and slimy. At certain times of year string algae seems to have patterns of blooming. Early Winter, early Spring, and mid-Summer seem to be among those times when string algae makes its presence well known in our ponds. In reality string algae is always in our koi ponds and water gardens but is not a problem until those blooms occur. And when those string algae blooms happen at the same times every year the same string algae treatments and equipment go flying off the shelves of pond retailers. So what causes string algae? It seems to always be there, but can be introduced many ways including via fish, plants, wind, humans, etc. There are a number of factors that will affect the growth and bloom rates of string algae. Some of the more obvious would be a dirty pond and dirty filters, overfeeding, overstocking, over-fertilizing, and/or poorly managed ponds with an abundance of nutrients in the water. Other factors may include changes in how your more complex aquatic plants such as water lily, water iris, pickerel, lotus, etc. are consuming nutrients. At certain times of the year our complex plants consume more nutrients leaving little available for algae to utilize. The root cause (no pun) of all the blooms is high nutrients which can occurr in many different ways too numerous to list here but alluded to above. 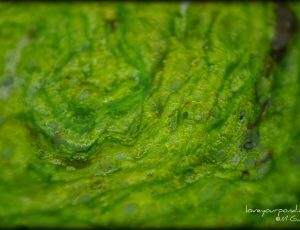 The good news is that string algae is not necessarily bad for our pond, it is much more of a nuisance than a danger, and even has some benefits to it. Let’s talk about the good first. String algae can add a bit of habitat to your pond for baby fish, tadpoles, dragonfly nymph, snails, and other small pond critters. It can be a food source for many of the critters just listed, as well as adult fish. String algae has some filtration benefits and will actually remove nutrients from your water and help to improve water quality. String algae also provides a minor amount of mechanical filtration and will remove particulate matter from your pond water. When removing string algae you can often see “brown” water pouring out from the algae clump. this brown water is full of particulate matter that would otherwise have been in your pond reducing clarity. The bad of string algae is it grows on everything; blocking pump intakes, clogging filter pads, and obstructing open water swimming for the fish. String algae can create maintenance issues, and even create oxygen crashes if left unchecked, which can be deadly to your livestock; and a heartbreaking experience. Luckily there are many ways to control string algae with the variable being how long you are willing to wait for the algae to clear. Increasing, supplementing, improving filtration to process nutrients more efficiently is kind of the no brainer solution to string algae control. There is also the organic time tested method of letting the algae bloom, peak, and die; this take time and patience. you can practice manual removal as well and get in there to start pulling it. You could simply do a cleanout of the pond. There are chemical based and bacteria based treatments that clear string algae in your koi pond and water garden pretty quickly in most cases. Barley straw extract is an old favorite for control. Many pond professionals use EcoBlast treatment or String Algae Buster. Water changes can help reduce nutrients and growth rate of algae, and sometimes make it worse! Equipment such as ionizers are said to control and reduce string algae growth by half of more! Providing more oxygen to your pond with a simple air pump and diffuser is very effective, as well as adding more complex aquatic plants to out-compete algae for nutrient resources. Adding shade to your pond can help, tinting your pond water can help as long as you don’t mind blue or black water. On larger scale ponds grass carp can be brought into play to eat up the algae. Most of these are not overnight solutions, but all of them are effective when applied correctly, and can be combined treatments as well. It should be mentioned to be extremely careful with “overnight solutions”, sometimes fast acting changes are not the best thing for livestock. Even under the best scenarios there will always be a bit of string algae in your pond, which is not really a bad thing, a little is good IMO. As pond keepers our goal should be to control it, not actually remove it. Let’s enjoy the benefits of it without the nuisance factors that get us all nuts! Who likes seeing fish all tangled up in those long green strands,… not me! So the next time your pond or water feature get strung out, take step back and breath, you now have alot of solutions to choose from to get your pond safely back under controls. 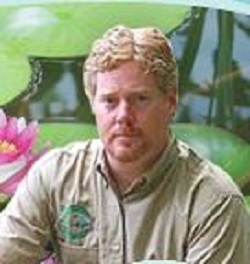 TO LEARN MORE ABOUT STRING ALGAE CHECK OUT THE POND HUNTER PODCAST ON STRING ALGAE CONTROL. CLICK HERE AND LISTEN!